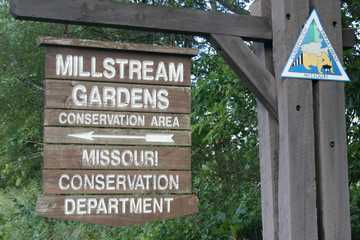 Millstream Gardens Conservation Area, home of the annual Missouri Whitewater Championships. 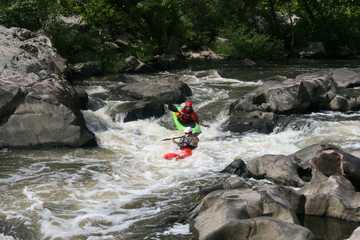 Located a short distance east from the DragonFly-In is the only true whitewater kayaking stream in Missouri. In the Millstream Gardens gorge of the St. Francis River, the waters tumble through boulder-strewn rapids with names such as Big Drop, Cat's Paw, and Rickety Rack. Canyon walls of ancient granite and tall stands of native shortleaf pines frame the scene. Together with the adjacent Silver Mines Recreation Area in the Mark Twain National Forest, this five-mile stretch is unlike any other river in the Missouri Ozarks, and resembles the mountain rapids found in the western Rockies or the eastern Appalachians instead. Every year, in March, whitewater enthusiasts from across the region congregate here for a weekend, to compete in the Missouri Whitewater Championships. The river usually has sufficient water for the rapids to be runnable for most of the winter and spring, although by summer the flow dries to a trickle between placid pools among the granite boulders. Visit www.missouriwhitewater.org for race details. However, this Conservation Area with its trails and views is a beautiful place to visit and hike, at any time in any season.